Mesa, AZ (July 24, 2017) – Estenson Racing is thrilled to announce that AFT Singles title contender Kolby Carlile has joined the team effective immediately in a deal that includes the 2018 American Flat Track season. Carlile’s arrival completes a momentous couple of weeks for Estenson Racing that also saw Sammy Halbert earn X Games gold in Minneapolis. 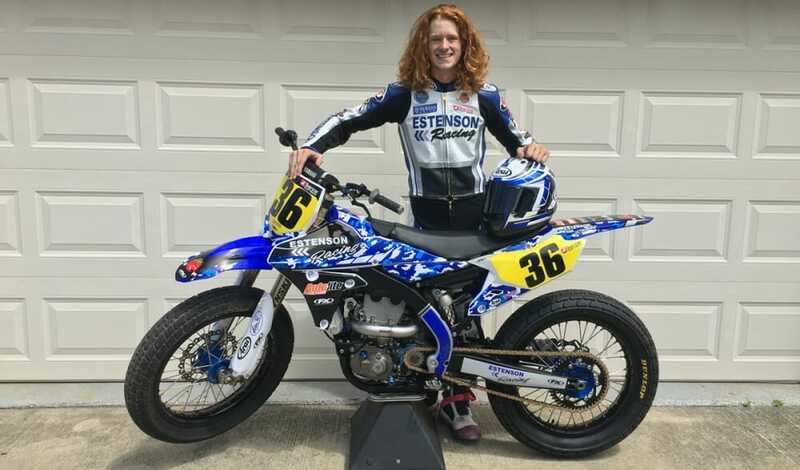 With Halbert currently ranked fourth in AFT Twins competition on the strength of four podiums, the addition of Carlile rounds out the Estenson Racing team lineup. It also returns the squad to AFT Singles action in which it reigned victorious in the first two races of the 2017 season with Dalton Gauthier. Carlile, who just turned 20 earlier this month, is one of the sport’s “Rising Stars.” The New Yorker earned his first-career AFT Singles victory last season at the Charlotte Half-Mile en route to an eventual fourth-place championship ranking. Carlile has only continued his rapid ascension in 2017, and he currently sits second in the AFT Singles championship fight. To date this season, he has secured three podiums, seven top fives, and has a worst result of seventh outside of an unlucky DNS at Lima due to a mechanical issue suffered after demonstrating race-winning pace. Andrew Butler has also joined the team to serve as Carlile’s mechanic. “I’m super excited to be joining up with the Estenson Racing team,” Carlile said. “As soon as I started talking with them, I realized how professional and serious they are about this. The new Yamaha YZ450F bikes I am riding now are unreal fast, and I already feel at home on them. Click here for more Flat Track news on Cycle News.